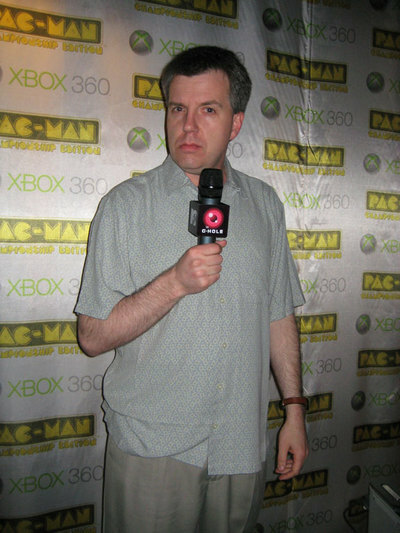 At the Pac-Man World Championships, we ran into the man that Xbox 360 fanboys and girls know and love -- namely, Major Nelson (whose real name is Larry Hyrb), the Director of Programming for Xbox Live. He keeps gamers informed of all things Xbox on his blog, including the new Pac-Man Championship Edition, available at 5 a.m. EST tomorrow. Major -- er, Larry -- was a cool guy, and he had us laughing our asses off with his enthusiastic explanation of the whole event (despite his bad run-ins with Pac-Man at the workplace). If there were achievement points for being entertaining, Major Nelson would get the full thousand.